You just searched for . The chance of flooding from rivers or the sea in this area is greater than once every 30 years ( >3.3% ). Sign up to FloodAlerts to receive updates about flood risks in your area. The chance of flooding from rivers or the sea in this area is between once every 1000 and 100 years ( 0.1 - 1% ). The chance of flooding from rivers or the sea in this area is less than once every 1000 years ( <0.1% ). Hint: You can get a more accurate location by moving the pin. The blue areas on the map represent the different levels of flood risk. You can change the opacity of these areas by using the slider below. The chance of flooding from rivers or the sea in this area is between once every 100 and 30 years ( 1 - 3.3% ). The map shows the Environment Agency's assessment of the likelihood of flooding from rivers and seas across England. Data is available under OGL V2. We use the Environment Agency's data to let you know the likelihood of flooding from rivers or the sea in England. The Check My Flood Risk map is designed to increase awareness among the public of the likelihood of flooding from rivers or the sea, and to encourage people living and working in these areas to find out more and take appropriate action. Please Note: This map is intended as a general guide only. It uses open data, which is distributed by the Environment Agency for England. If you have any questions regarding using the Check My Flood Risk map and any of its features, you can contact Shoothill via email at [email protected] or telephone on (+44) 0845 421 0390. How do I find my property on the map? 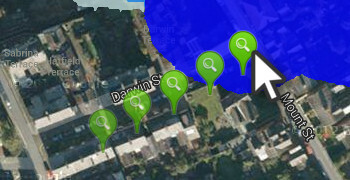 To get the most accurate results users are recommended to enter a full postcode into the search bar. However to increase the accuracy of your search, you can also drag and drop the green location marker over an individual property. Once you have the location marker in the correct location the ‘nearest flood risk calculator’ will update and will do so each time you move the pin or complete a new search. High means that each year this area has a chance of flooding, from rivers or the sea, of greater than 1 in 30 (3.3%). Medium means that each year this area has a chance of flooding, from rivers or the sea, of between 1 in 100 (1%) and 1 in 30 (3.3%). Low means that each year this area has a chance of flooding, from rivers or the sea, of between 1 in 1000 (0.1%) and 1 in 100 (1%). Very Low means that each year this area has a chance of flooding, from rivers or the sea, of less than 1 in 1000 (0.1%). Note: All of these levels of risk take into account the effect of any flood defences that may be in this area. Flood defences reduce, but do not completely stop the chance of flooding as they can be overtopped or fail. The map tells me I live in an area at risk, so what do I need to do? There are some simple steps you can take to reduce the impact of flooding on your home and business. These simple actions will help reduce the chance of flooding and the harm it would cause to you and your property. Sign up for EA flood telephone flood warnings here. 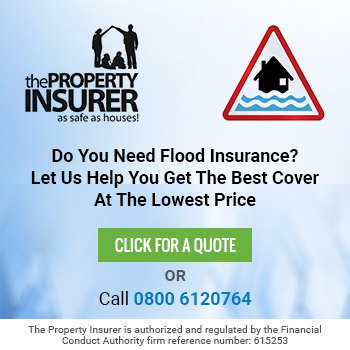 Find out how to prepare your property for flooding. It is important to remember that while the risk is low, it can never be eliminated completely and there are lots of things you can do so that, should the worst happen, you are able to get back to normal as fast as possible. Surrounding roads and services like schools, or utilities such as water may still be affected and can impact on you. This information is provided as part of the Environment Agency Open Data initiative and as such, Shoothill excludes all representations, warranties, obligations and liabilities in relation to this information to the maximum extent permitted by law. Shoothill is not liable for any errors or omissions in the information, nor is it liable for any loss, injury or damage of any kind caused by its use. Shoothill does not guarantee the continued supply and update of the information. For access to the shape files used on the map, please contact us at [email protected]. The Risk of Flooding from Rivers and Sea (RoFRS) from the Environment Agency is available here: http://data.gov.uk/dataset/risk-of-flooding-from-rivers-and-sea. You can also access Environment Agency, Flood, River Level, Groundwater, River Flow and 3-Day Flood Forecast data via the Shoothill APIs here: http://www.shoothill.com/environment-agency-liveapi/.